Today I’m writing in response to a prompt from the creative minds at WordPress on August 15, 2016. I guess it comes as no surprise that I’ve discovered I love writing, but sometimes it can be easier said than done. The prompt was (is): Tell us about a habit you’d like to break. While I can’t say much about a habit I’d like to break, I can say a lot about a habit I did break and, though I cannot remember the day I decided to stop smoking and exorcise my nicotine demon, I do remember the last day I had a cigarette – it was Friday, July 4, 2008. Giving up smoking on that particular day had nothing to do with a nation that celebrates freedom from British tyranny and everything to do with the following day – my birthday – the best day of the year, the finest day to begin a new journey, and the most wonderful day to start afresh. As for when I made the decision to quit, well, that’s much harder to put my finger on. I’d been trying to give up for years. Not weeks, or months. Not even a couple of years, but much longer than that, and during that time every attempt left me with heightened cravings and ever more intense feelings of failure as, once again, my demon won the battle. I managed to give up once. It was before having an operation. My doctor had said “No cigarettes for four weeks beforehand!” and I didn’t. That is I didn’t have any cigarettes during those four weeks leading up to going into hospital. But I’m ashamed to admit that as soon as I was upright and walking unaided, my demon reared his ugly head and I lit up. I can still hear the crack of the cellophane as I tore the opener around the packet and inhaled that sweet scent trapped inside. My demon ensured I’d purchased a packet and hidden it amongst the personal items I needed for my three-day stay. I still remember that first cigarette tasted like the worst thing on earth and you’d think that would be the perfect opportunity for me to say ‘Enough!’. But sadly, it wasn’t. My demon relished the nicotine coursing through my veins and promised the next one would taste better, and true to his word it did, and the next even better, until finally, they tasted so good I was hooked all over again. When my friend finally finished, regaining some semblance of control over her funny bone, she told me I’d been trying to give up smoking the whole time she knew me. In fact, in all the years she’d known me, she’d never known me to be not trying. We’d known each other for ten years. That’s ten years of failing to exorcise my demon, ten years of berating myself for failing, and ten years of living with those ever-increasing intense feelings of failure. I’d tried everything – patches, gum, cutting back, even going ‘cold turkey’ – but while the first week or two were always relatively easy to get through, beyond that it became harder and harder to resist the temptation of my demon, and before I knew it, I’d be trapped again and swearing that one day I’d do it. And just like that, my demon was gone. I could almost see my demon waft away like an insubstantial tendril of smoke, slowly curling upwards, caught in a thermal current and carried off, away from me, and gone forever. Finally, a reason to be without my demon. Finally, a reason to stop being so weak. Finally, something worth fight for. Life with the love of my life. How had I not seen it earlier? I won’t lie, there have been hard days. Days when it would have been so easy to light up. Days when I would go outside and eat my lunch with my (smoking) co-workers just to get a whiff. Days when I would stand on the footpath and contemplate stepping inside that store to buy a packet – just a small one and a box of matches. But I’m making it sound like those few days were hard, they weren’t. Being positive, actually focusing on breathing easy, thinking of what I was gaining – as opposed to what I thought I was losing – made it easier to get through those few tough times. To boost myself along, I created a file in Microsoft Excel that I opened every morning to see the progress I was making. At first, the number was painstakingly slow to grow, but the days soon started adding up at a quicker rate and that total number of days I’d been breathing easy started to get bigger and bigger. Soon enough, and yes it was soon enough, I could smell flowers as I walked past, food developed an intense flavour, and cigarette smoke became a foul thing I didn’t want anywhere near me, let alone my olfactory or my lungs. I started rewarding myself when I reached a milestone, just little treat – a new pair of earrings, a new charm for my bracelet, a new ring for a finger – nothing too expensive, and certainly the cost of these little rewards were minimal compared to the money I’d already saved. Then came a huge milestone – Day 1,000 – and I was not backwards in coming forward with a reward. To celebrate this day I thought I would never reach, I gave myself a gold bangle. Nine carat, solid gold, the thing weighs a tonne. Ok, it’s not that heavy, but it is heavy on my wrist, and it’s shiny, and it’s elegant and, I love it. Day 2,000 came and went without me even knowing it was a milestone. I had to go back and check and discovered it was Christmas Day 2013, but by then I no longer needed to reward myself to keep going, and I’d long since stopped opening my Excel file just to see those days adding up. In the back of my mind, I knew that number was getting bigger and bigger and I didn’t need to see the number to believe it. Now here I am today, the day that marks 3,000 days of breathing easy. Wow! I have to say that again. 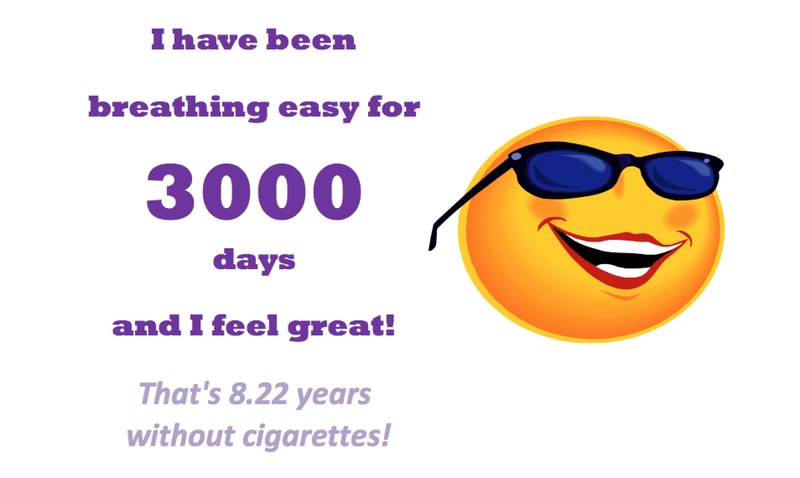 Three thousand days (it looks better spelt out), and countless dollars better off, with healthy lungs and a system free of nicotine poison. A shot from the Excel file I created to tell me how many days I’ve been breathing easy. Before I know it, that number will 3,653 – ten years and one day – and finally, after having fought that demon for so long, I’ll have been breathing easy longer than I’d have been fighting to exorcise him. And I’m pretty chuffed about that! Yep, I did miss this! You’re in my Reader, but I must not have read down far enough. Congratulations! That’s totally awesome. Did you celebrate? You know, you really are quite an accomplished writer. Even when writing something like this, your writing is very lyrical. I wonder how you do with a journalism assignment. A day in the life of the American elections for example. I’d be curious to see something like that. I think you’d make a perfect free lancer! Oh, you are too sweet – honestly. Politics share the living daylights out of me, but I must admit, I’ve been giving serious thought to studying ‘Creative Writing’. With a qualification to back me up, I think I could (and perhaps, would), go places, or at least ‘score’ some work. I still get a little choked up thinking about it myself. I had to didn’t I? What else would I have done? Congratulations my friend! Keep on keepin’ on!